Kernow Men’s Society are delighted to announce that we have been successful with our application to St Austell Town Council for a grant under their Small Grants Scheme. The Town Council’s Small Grants Scheme is operated by the Council’s Community Committee and is open to community organisations based in or working in the Parish of St Austell. As a not for profit local community group based in the Parish of St Austell, KMS relies on the generosity of others when it comes to funding our running costs and without that generosity we would not be able to continue to offer our twice weekly meetings to group members. This grant is a very welcome boost and will go towards the running costs of the society, for example for items including ongoing refreshments, the hire costs of our meeting room and in getting our message across to more men in the area who might benefit from what we do. 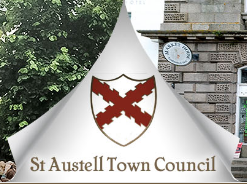 We would like to offer our grateful thanks to the Community Committee at St Austell Town Council for making the grant and in particular to Sara Gwilliams, Deputy Town Clerk, for her assistance throughout the grant application process. Sara has proved to be a willing sounding board for our many queries during the process and was good enough to inform the group’s Chair personally about the application being successful…many thanks again Sara!